For other versions of this character, see Ishizu Ishtar (disambiguation). Yu-Gi-Oh! episode 52: "The Past is Present"
Ishizu Ishtar (イシズ・イシュタール Ishizu Ishutāru) is a character in the Yu-Gi-Oh! manga and the second series anime. Her name is sometimes rendered by fans as Isis Ishtar (as "Ishizu" is the pronunciation of the name "Isis" in Japanese). Her name is derived from the Ancient Egyptian goddess Isis and the Ancient Mesopotamian deity Ishtar. She is the modern day version of Priestess Isis. Ishizu is portrayed as a kind, wise, compassionate, spiritual, and intelligent woman displaying strong maternal characteristics. She is solicitous about the welfare of her family members and those around her, especially her brother Marik (particularly when she joins the Battle City tournament to try to save him), and is loyal to her family's duty to the Pharaoh. Spiritually, Ishizu is known for preaching her beliefs in the nature of fate and destiny, whether its through following her visions, predicting the future with her Millennium Necklace, or remaining committed to her family's destiny to serve the pharaoh. Ishizu wields the Millennium Necklace, a powerful ancient Egyptian artifact which affords her certain powers to foresee into the past and future. Ishizu became a museum curator working for the Egyptian government agency, the Supreme Council of Antiquities in order to lure Yugi Muto and Seto Kaiba to her in order to prevent Marik and the Rare Hunters from fulfilling their plans. In spite of her brother's betrayal of the family, she believes that there is still a sufficient amount of good left in his heart. Ishizu's design incorporates multiple layers of clothing and a wide range of expressions. Depicted here is the Duelist in her attire from the Battle City tournament (top) and her casual clothing (bottom) from front, side and rear views and alongside views of her head from different angles. Ishizu has long straight black hair that trails just below her shoulders and features 2 locks wrapped in gold rings coming from behind her ears and continue in front, stopping at her neck. She is slender in build and has tanned skin. She wears the Millennium Necklace around her neck prior to giving it to Yugi. Ishizu's first outfit consists of a long ankle length dress partially bearing her shoulders featuring black patterns around the neck and the rims of the sleeves. Her jewelry consists of a gold piece of headwear circling her head and featuring an emerald where it meets at the front. During the Battle City tournament she wears a cream colored sleeveless one-piece dress with the bottom similar to a sarong, a matching waist length veil which widens and spreads below her shoulders and gold sandals. Her jewelry consists of gold bracelets, ankle bracelets, armbands and brooch bearing the Eye of Wdjat on her veil. She initially wears a piece of cloth over her mouth to conceal her identity. Ishizu's family guarded the tomb of the Pharaoh for generations and 2 of the Millennium Items: the Millennium Rod and the Millennium Necklace, which were were passed on to Ishizu and her brother Marik. Marik, who was forbidden to leave the Pharaoh's tomb because it might divert his attention away from his Egyptian heritage, convinced Ishizu to let him take a trip outside. Marik no longer wanted to become a Tomb Keeper and when he was forced to take the initiation ritual to become a full Tomb Keeper, he unwillingly unleashed Yami Marik, who took the Millennium Rod for himself. In the manga, Yami Marik specifically skinned his father with it and then threw the skin of his father's back (bearing the scars of his own initiation ritual) onto the back of the unconscious Odion. In the original anime, Marik killed his father via the dagger inside the Millennium Rod to stop him from killing Odion. In the dub, he sent his father to the Shadow Realm. Regardless, Yami Marik was sealed away in Marik's body by Odion. Ishizu attempts to stop Marik's quest of unlocking the power of the Pharaoh for himself by taking the Egyptian God Card, "Obelisk the Tormentor" before Marik can. Ishizu is the Secretary General of the Egyptian Supreme Council of Antiquities at the Domino City Museum. She became a museum curator in order to lure Yugi Muto, Seto Kaiba, and the Rare Hunters in order to save her brother from his darker alter ego, Yami Marik. She gives Kaiba "Obelisk The Tormentor" in exchange for prompting to him with the idea of starting the Battle City tournament, where he could acquire the remaining Egyptian God Cards, but told him that regardless he would end up returning the card by predicting this using the power of her Millennium Necklace . Though Kaiba refuses to believe her preaching regarding the nature of destiny and his ancient Egyptian heritage, he has ulterior motives of reclaiming title as the number one duelist. Ishizu qualifies to the Battle City quarter-finals, where she duels Seto Kaiba. She predicts all of Kaiba's moves and foresees her victory, but a vision of Kisara caused by the Millennium Rod compels Kaiba to summon "Blue-Eyes White Dragon" instead of "Obelisk". Kaiba claims to make his own future and Tributes "Obelisk the Tormentor" and "Gadget Soldier" to Tribute Summon "Blue-Eyes White Dragon", hence avoiding his predicted defeat. Though Ishizu lost the duel, the loss taught her a valuable lesson of greater importance about the nature of destiny as it gave her hope for changing her brother's future. She relies on the wisdom and strength of the people around her, in particular Kaiba himself for eventually eradicating Marik's evil trapped within. Following her loss, Ishizu gives the Millennium Necklace to Yugi, claiming that it is no longer necessary as the future it predicts is not infallible and can be changed. During the finals where Yugi faced Marik, Odion convinces Marik to accept responsibility, freeing him from Yami Marik. Ishizu and Marik are then able to fulfill their duties as Tomb Keepers, by revealing the Pharaoh's memory which had been carved (Tattooed in the English anime) onto Marik's back. Ishizu, Marik and Odion then return to Egypt to start a new life. During the Dawn of the Duel arc, Ishizu, Marik, and Odion lead Yugi and co. to the Tablet of Lost Memories, where he must enter the World of Memory to regain his memories of his past. 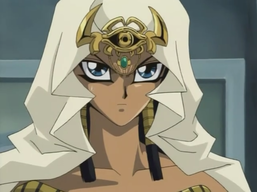 After the Pharaoh recovers his memories and his name in the Dawn of the Duel arc, Ishizu, Marik and Odion lead Yugi and his friends to the tomb of the Pharaoh in order for Pharaoh Atem and Yugi to have a final Duel in order to determine if the spirit will move on to the afterlife or remain in the present for another 5,000 years. When the Duel is over and the tomb is destroyed, Ishizu states that her family's duties as the Pharaoh's Tomb Keepers are finally complete since his spirit has returned to the nether world and the Millennium Items have been sealed forever. Being the member of the tombkeeper's family, Ishizu feels obliged to serve Yami Yugi to help him as only Yugi can help save her brother and the world. With her being the modern reincarnation of Priestess Isis, Ishizu still feels an inclination towards helping the Pharaoh as one of the members of Pharaoh's court. As Yami Yugi and Tea enter the museum in Ishizu's exhibition, hoping to find out something about the past of the former. Ishizu shows them the old tablets, revealing to Yami Yugi that he was a powerful Pharaoh who, five thousand years ago, saved the world from misfortune; the fate of the Egyptian sovereign. As fate would have it the young Ishizu tells Yami Yugi that he is to prevent the destruction of humanity again by persuading Yami Yugi to enter the Battle City tournament in order to fulfill his destiny. After her loss at Battle City against Kaiba, Following her loss, Ishizu gives the Millennium Necklace to Yugi, claiming that it is no longer necessary as the future it predicts is not infallible and can be changed. Given the events of the past are to happen again in the present day, Yami Yugi felt he was destined to face Kaiba. After Yugi's victory at the Battle City tournament, Ishizu explains that millennia ago, the Pharaoh saved the world, but missed the memory that he needs to recover today; For this reason, he has entrusted his memories to a family. 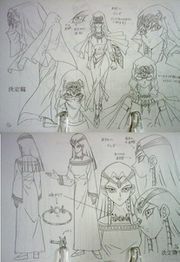 At the end of the Anime Ishizu with her brothers come to Pharaoh to take him to the tablet of the lost memory so Pharaoh can remember his name as well as his rest of the memory. After Pharaoh regains his memory, she leads him and the gang to the tomb of the Pharaoh to return the Millennium Items to the Tomb so that the Pharaoh can move on to the afterlife. In the anime, Ishizu first meets Kaiba at the Domino City Museum when she personally invites him for a private exhibition regarding the opening of her highly anticipated Egyptian exhibit through a televised press conference invitation. With her belief in the nature of fate, she felt that it be destined that the two would cross paths. Ishizu then gives a private showcase of never seen before artifacts depicting the origin of Duel Monsters as well as the secret of the Egyptian God Cards. She then postulates to Kaiba of starting a Duel Monsters tournament in order to help draw out the Rare Hunters in the open as well as offering him Obelisk the Tormentor to borrow during the duration of the tournament. During the Battle City tournament, Ishizu attracts Kaiba's attention during her first and only duel against him as she flawlessly predicted Kaiba's every strategic move and causing him to squirm. Ishizu gracefully manipulated every move he made and foiled his strategies causing her to toy with Kaiba's mind nearly humiliating him with a loss. Though Ishizu lost the duel, the loss taught her a valuable lesson of the greater importance regarding the nature of destiny as it gave her hope for changing her brother's future relying on the wisdom and strength of the people around her, in particular Kaiba himself for eventually helping her eradicate Marik's evil trapped within. As the Battle City tournament drew to a close, Ishizu advises Kaiba to be present for the final duel of the Battle City tournament in order to assist Yami Yugi in fulfilling his dueling destiny by defeating Yami Marik. Anxious to cultivate Kaiba's aid to help Yugi, the young Ishizu solicitously convinces the reluctant and selfish Kaiba to help Yami Yugi win the final duel, where the eventual outcome of it will depend on the salvation of the world and impact the future of mankind. She then explains to Kaiba that the destiny of the latter is to contribute to the triumph of light, and that, in antiquity, he was, indeed the Pharaoh's adversary, but also a friend who constantly challenged him to push him to improve.She warned Kaiba that walking away from the tournament is a huge mistake and forewarned that his entire future is at stake. Ishizu also scolds him for Kaiba's hesitance in helping Yami Yugi as well as denying his ancient Egyptian heritage by reasoning with him stating that he'll suffer the consequences and the fate of the entire world will suffer as a result of his obstinate stubbornness by turning back on mankind. She also lectures Kaiba that he was destined to organize the event guided by a force beyond his control and how his modern day rivalry with Yugi has been in existence for thousands of years. In addition, Ishizu also informs Kaiba about how his rivalry with Yugi as his past incarnation as as a skilled sorcerer who constantly challenged the Pharaoh and with the sorcerer's help, the Pharaoh was eventually able to save his own people. Ishizu's solicitous coaxing to cultivate Kaiba's assistance eventually convinced him to give one card to help Yami Yugi take down Yami Marik's Winged Dragon of Ra. In the Japanese version, Ishizu uses the personal pronoun "watakushi", an antiquated and archaic self-reference. Ishizu primarily plays a Fairy Deck, but in contrast to the traditional Fairy-Type monsters, Ishizu's Fairies are EARTH Attribute and have Egyptian appearances. In her Duel against Kaiba, Ishizu focuses on allowing Kaiba to destroy her cards and turns his strategy back on him with "Exchange of the Spirit", leaving Kaiba with only six cards left in his Deck while Ishizu's cards were restored. She then relied on "Muko" to negate Kaiba's draws until he was forced to Summon "Obelisk the Tormentor". Ishizu planned to destroy "Obelisk" with "Sacrifice's Blast", but a vision from the Millennium Rod convinced Kaiba to win using his "Blue-Eyes White Dragon" instead, unknowingly negating Ishizu's strategy by sacrificing "Obelisk" to Summon the dragon. Ishizu uses the following Dice Pool in the video game Yu-Gi-Oh! Dungeon Dice Monsters. Ishizu uses the following Capsule Monsters in Yu-Gi-Oh! Capsule Monster Coliseum. ↑ 1.0 1.1 1.2 1.3 1.4 This card was played as a Normal Monster It is an Effect Monster in the TCG/OCG. ↑ 2.0 2.1 This card is discarded via the effect of her own "Michizure of Doom". This page was last edited on 28 June 2018, at 20:31.